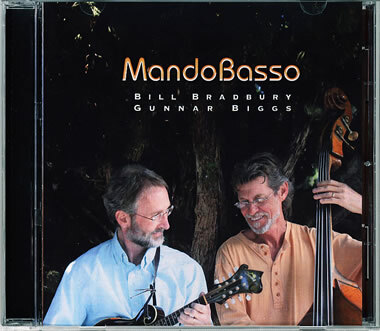 What started as an affiliation in academia between a Phd in Composition from Cornell, and a veteran jazz musician – has resulted in a premiere CD by MandoBasso — a duo featuring Gunnar Biggs on bass and Bill Bradbury on mandolin. If you are looking for a genre to fit MandoBasso’s music in — perhaps “Academic Americana” would fit the bill. Biggs and Bradbury first came together as colleagues working on projects at both Palomar College and Cal State San Marcos. Biggs comes from a strong background in jazz and classical performance, Bradbury from a composition and computer music background. 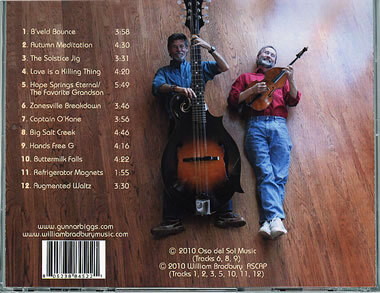 Their mutual love of Irish and traditional American music brought them together in this unique pairing of mandolin and bass. MandoBasso performances include arrangements of traditional music, new compositions, classical music repertoire, jazz and ragtime.